01 Toyota Camry Toyota is well-known for its expertise in hybrid technology, and its newest model is also its most refined. 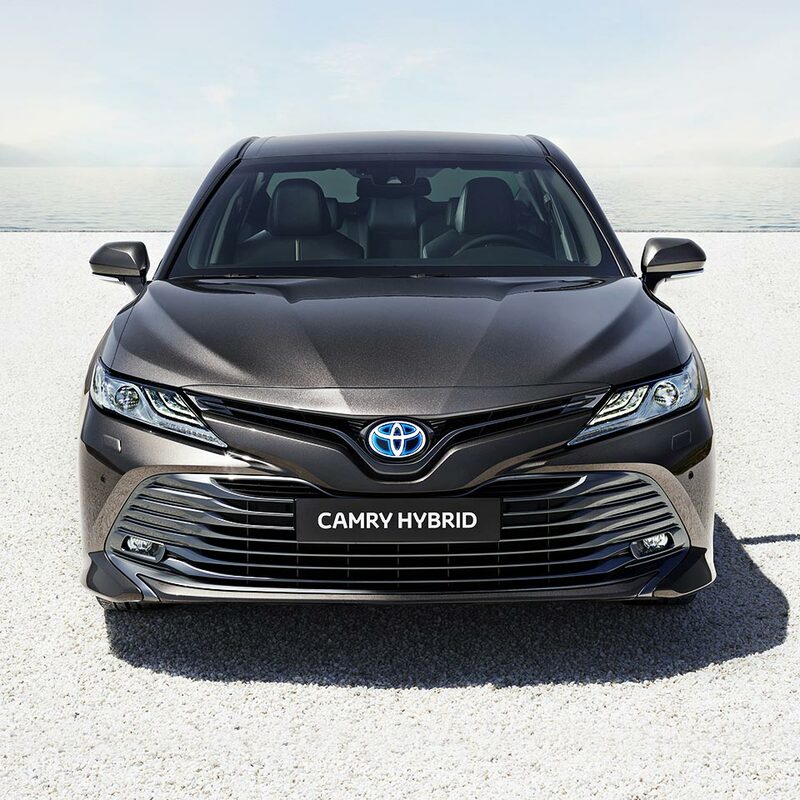 The Toyota Camry Hybrid, an intelligent and dynamic saloon, is back after 14 years and offers an advanced driving experience in every respect. 02 Exterior design Muscular and bold in its styling, the Camry carries traits of an American model, with its wide frame, long bonnet and aggressively styled front end. Showcasing the Toyota New Global Architecture design philosophy, it rides close to the ground, providing a low centre of gravity and high body rigidity, which translates into exceptional control on twisty roads. Meanwhile, sweeping lines and a grooved bonnet work alongside a prominent front air intake to improve airflow around the model and keep the engine cool. With slender headlamps that incorporate LED strips and multi-spoke alloy wheels too, it’s a real head-turner wherever it goes. 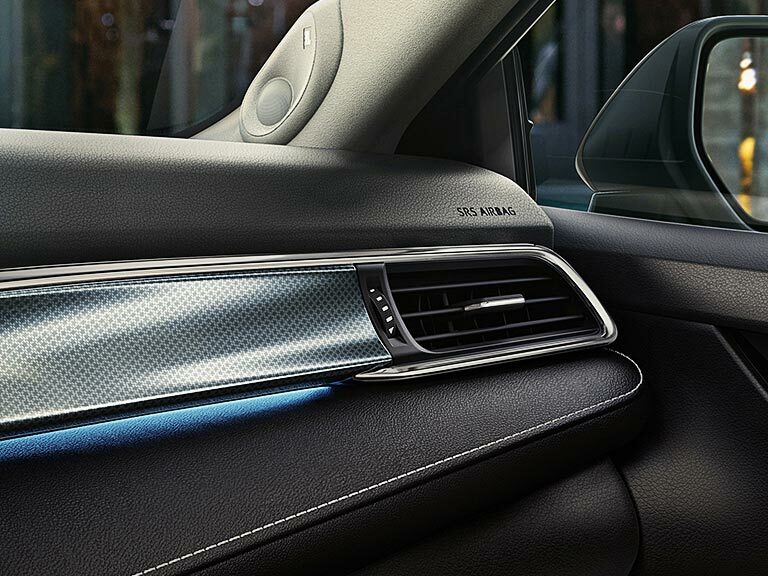 05 Safety & technology A set of active safety features ensures the protection of you and your family in a variety of circumstances. Called Toyota Safety Sense, it incorporates technology such as Pre-Collision Safety with a Pedestrian Detection Function, which can identify potential collision risks and act to mitigate them if you fail to respond in time. There’s also Lane Departure Alert with steering assist to keep you centred in your lane on high speed roads, and Automatic High Beam to provide optimum visibility without dazzling oncoming drivers when you’re out and about at night. Passive measures have also been put in place. The Camry’s structure, for example, is designed to disperse the energy of a collision, absorbing the impact and controlling damage. 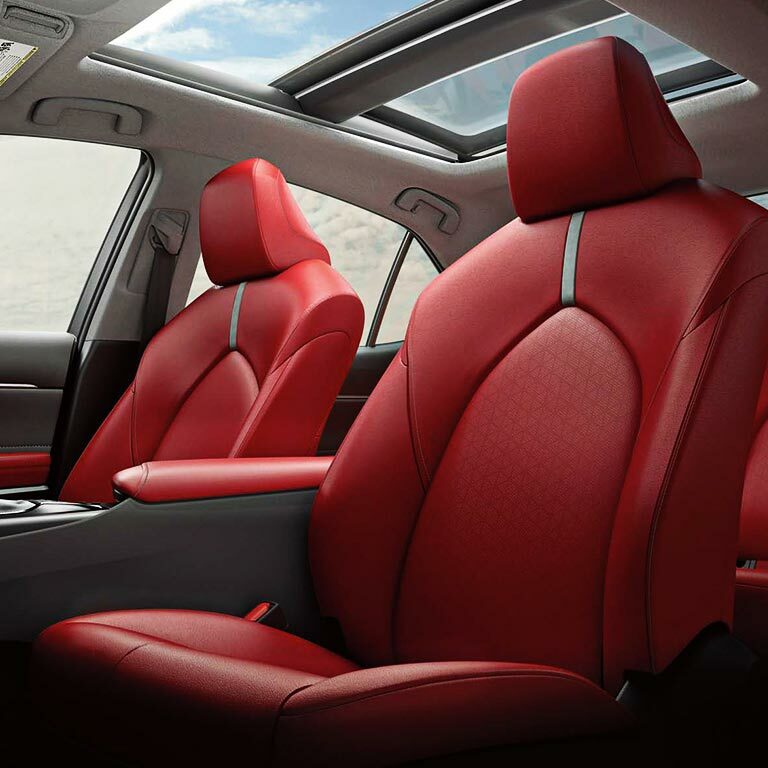 There are also several airbags around the cabin to cushion you in the event of a crash. 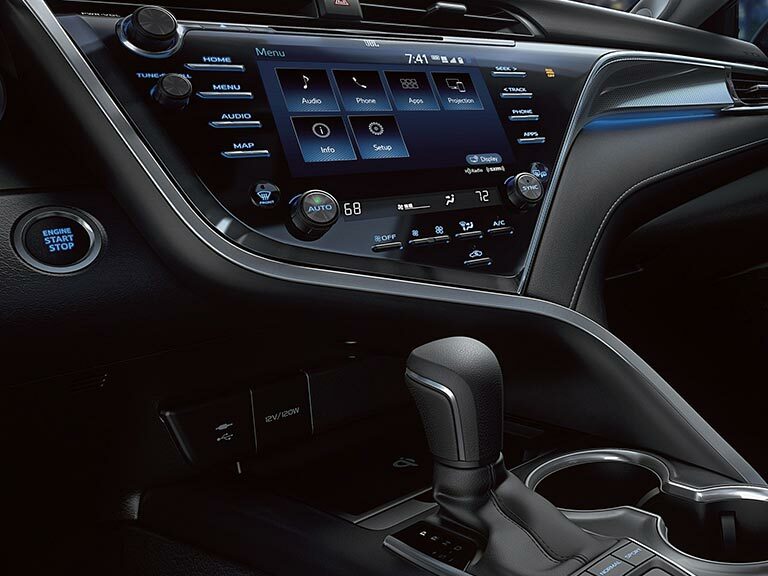 In the cabin, the technology is no less advanced. 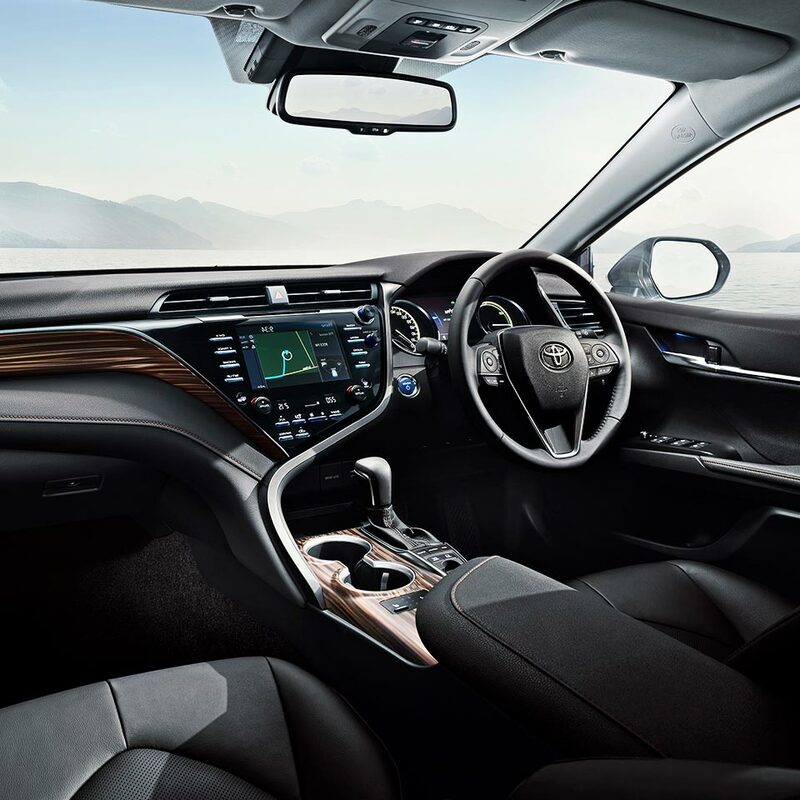 There’s a seven-inch multi-information display and the latest iteration of the Toyota Touch 2 system, complete with an eight-inch screen, DAB radio, Bluetooth connectivity and more.